The Soft Grip Safety Air Gun is in stock for immediate shipping and has a durable cast aluminum body that is suited for rugged industrial use. The ergonomic design has a large trigger and a soft, comfortable grip for easy operation and keeps the hand in a comfortable position for extended periods of use. A convenient hook hanger allows for easy storage when not in use. Aluminum Extensions (up to 72″ long) and Stay Set Hoses (up to 36″ long ) can be fitted, providing access to hard to reach places. Chip Shields are available for most models, protecting operators from flying debris, helping to meet an important part of OSHA’s requirements for the safe use of compressed air, OSHA Standard 1910.242(b). When outfitted with EXAIR’s engineered air nozzles, the Soft Grip Safety Air Gun is a powerful ally to reduce personnel noise exposure and protect them from noise induced hearing loss. This is another important safety feature complying with OSHA’s standard 29 CFR-1910.95(a). The Soft Grip Safety Air Gun can be configured to meet applications from delicate blowoff of electronic circuit boards to large chip removal in metal cutting operations, and everything in between. If you have questions regarding the Soft Grip Safety Air Gun, or would like to talk about any EXAIR Intelligent Compressed Air® Product, feel free to contact EXAIR and myself or one of our Application Engineers can help you determine the best solution. The Stay Set Hose is a popular, and practical, accessory for use with many of our blow-off products. Thread one end onto a compressed air supply connection, thread a Super Air Nozzle (or maybe even a small Air Amplifier or short Air Knife) onto the other end, and you’ve got an easily repositionable blow off…which will reliably hold its position. Thing is, they really needed the flexibility of the modular hose, but it’s not rated for the pressure supply required for a Super Air Nozzle. This is what makes our engineered products so efficient; they use the Coanda effect to amplify the compressed airflow..and they use the supply pressure to do that. So they can’t install a Super Air Nozzle on what they have now. Enter the Stay Set Hoses: They’ll bend to direct the nozzles’ air flow right where you need it, and they’ll keep it there until you bend it again. Which (back to what’s most important to this caller) is exactly what they needed. With our efficient & quiet Super Air Nozzles, they’re saving compressed air and improving the conditions of their work environment. With the Stay Set Hoses, they’re able to quickly & easily rig the air flow before running a job, knowing they won’t have to worry about it until the job’s done. 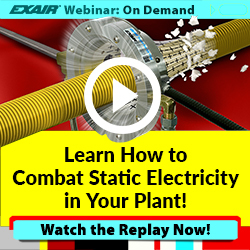 EXAIR Stay Set Hoses hold their position as long as you need them to. All day, every day. “Set it and forget about it” is a benefit you can realize from many EXAIR Intelligent Compressed Air Products. If you’d like to find out more, give me a call. Air Knives – What Are They Good For? This week I was speaking with a DJ who wished to use an air knife to create a blast of air that would add emphasis to the musical experience had by his fans. He wanted a small burst of air that would last less than a second, but would add an additional element to an already very complicated setup. My initial reaction was that no DJ I have ever seen would possibly be able to supply an air compressor big enough to feed the air knives, but over the course of our conversation, I found out that the DJ travels with 2 semi trucks of equipment, so he had some space. Another topic that came up in our conversation was how air knives were generally used. I have been asked this in a number of ways: What are they designed to do? Where do they work best? or What are they for? I never have a succinct answer… The air knives create a flat laminar sheet of air in various sizes from 3″ up to 108″. This laminar sheet of air can be used to move, open, float, or separate. 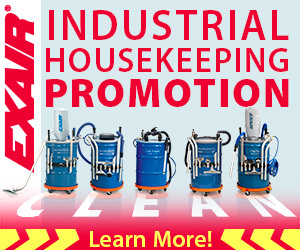 It can be used to clean, dry, or cool. I try to categorize these applications as best I can when speaking to customers, but then you talk to a DJ, and he wants an air knife to make a crowd cheer. I never thought that would be an application for an air knife. Knowing this, how do you convey all the air knife can do in a succinct answer? Well, I can’t, so please be patient when you ask me the same question and I run through applications from cleaning surfaces to entertaining DJ crowds. Here is a rundown of air knife applications. In case you don’t believe me. Move: Air Knives are used around to world to move product from a conveyor to another location. Open: Air Knives uniform air flow is perfect for opening bags or other packaging on a packaging machine. Float: If you need to bridge a gap between two conveyors, the air knife has done this for products from pizza dough to sheets of veneer. Clean: Blowing products off after removing them from a CNC machine is an easy air knife application. Dry: One of my tastiest applications was to use an air knife to blow water from a potato chip after washing, but before frying. Cool: Extrusion, molds, and baked goods have all been cooled with an air knife. Just because it isn’t on this list though, doesn’t mean it is not possible. This is why we will stand behind our stock product with our 30 day guarantee. 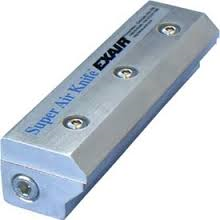 So if you want to try an EXAIR Air Knife in your application, give us a call. Categories Air Knife, Compressed Air•Tags air curtain, air curtains, Air Knife, air knife blower, air knifes, Air Knives, blow, clean, compressed air knife, convey, Cool, dawoerner, exair air knife, exair super air knife, Exair_DW, FAQ, flat nozzle, float, Frequently Asked Questions, industrial air blowers, move, super air knife, What is it for?